Practical goals that promote self-care and good health … and don’t require counting calories. As the clock ticks down toward 2018, many of us are finalizing our New Year’s resolutions. According to The Marist Poll, losing weight is the most popular (sharing the top spot with “being a better person”). It’s a great resolution if your doctor has advised you to lose weight, and if you have a solid plan and support system in place, but too often this resolution doesn’t come from (or lead to) the healthiest of places. I made this resolution last year solely to fit into old skinny jeans and other relics from my twenties. I went on to practically starve myself on January 2nd and 3rd, then scarfed down chocolate cake on January 4th, decided I was a total failure by January 5th and was right back to my old ways by January 6th. Why not make practical resolutions that promote self-care and good health that don’t involve a scale? 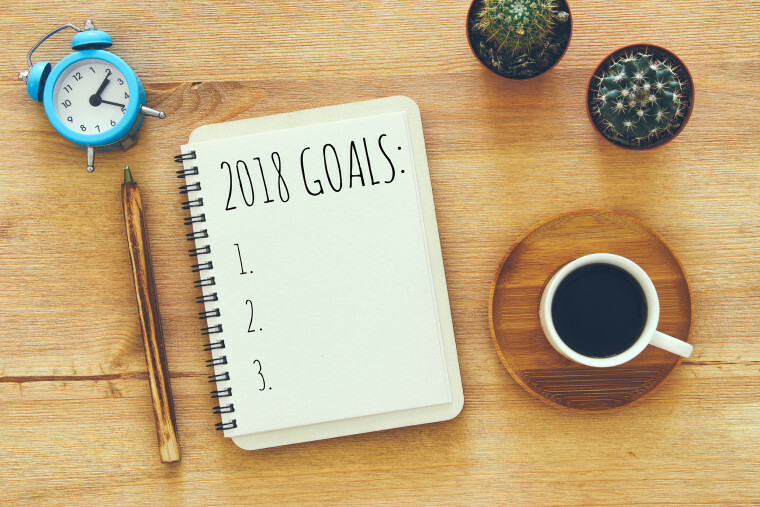 That’s my plan for 2018, so I consulted a variety of experts and fellow resolution makers to compile a list of resolutions I can actually look forward to keeping. If we’re making resolutions that center at all around our health, it’s important to know where we stand, and that means getting informed on our medical condition from head to toe. It may seem like a small goal, but stating hydrated can have drastic effects on your overall health, from more energy to better skin to increased productivity at work. Laura Arndt, personal trainer and CEO of Matriarc, tells NBC News Better she’s resolving to scale back on coffee this year. “I know I overload the caffeine so my goal is to cut back and stick to one cup of coffee a day.” Swapping that pre-meeting cup of java for some h20 may boost your energy and improve focus. Sleep (or more specifically, lack of it) is often the underlying cause of many of our health issues, including stress and anxiety, weight gain and low immunity. But sticking to a rigid sleep schedule can be tricky, especially after the holidays when we’re recovering from disrupted bedtime routines. So in the New Year, we can vow to start small. “Buying a Himalayan salt lamp, getting black out curtains or masking any light with electrical tape are all good starts,” adds Rachel Montañez, founder of Sleep 10:2. We may also want to consider eliminating screens from our bedrooms, cutting back on caffeine and alcohol before bed, and aiming to get at least seven hours of sleep each night. Just because I’m not looking to lose weight doesn’t mean I’m ruling out ways to improve my diet and habits around food. Enter: eating mindfully (aka not digging into a bag of chips in front of the TV or eating lunch at my desk). “Mindful eating, and what I describe as working with your authentic appetite, involves slowing down while we eat and paying attention to our body’s appetite, hunger and fullness signals,” says Becca Clegg, clinical director and founder of Authentic Living. “One of the primary focuses of mindful eating is to help you learn how to feed yourself when you are hungry, and stop when you are full.